Historically, cellulose-based materials have been used for manufacturing hemodialysis membranes and remain to date as the commonly used materials. Though cellulose triacetate (CTA) membrane originally has a homogeneous structure, recently, CTA membrane with asymmetric structure (ATA®) was developed. By a new spinning technology, irregularities or roughness in the inner surface of ATA have become less than those of the conventional CTA membrane. 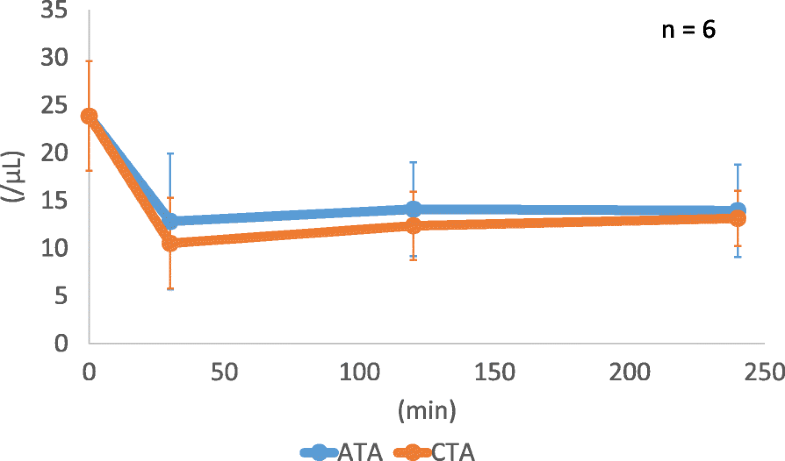 In this study, a comparison was made between CTA and ATA® membranes in order to evaluate the effect of physical structure of the membrane on the biocompatibility. 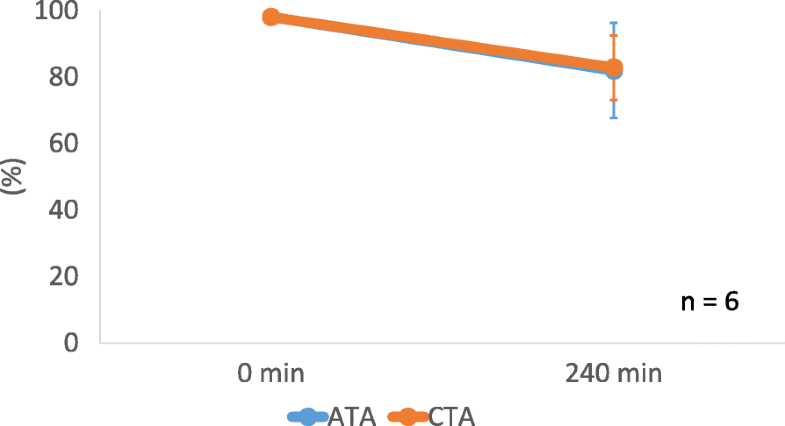 We compared the biocompatibility of the following two dialyzers with different triacetate membrane: FB-190UHβ with CTA, and FA-190F with ATA® (both from Nipro, Osaka, Japan). Heparin of 40 units/mL was put in a syringe, and test blood was collected from healthy volunteers. Then, the dialyzer and blood circuit were filled with the test blood. Subsequently, the blood was circulated by a roller pump at the rate of 200 mL/min. We measured the platelet counts, platelet factor 4 (PF4), β-thromboglobulin (β-TG), and CD41 and CD42b platelet surface markers at 30, 120, and 240 min. The average platelet counts at 30, 120, 240 min in CTA and ATA® were similar. The average β-TG and PF4 increased from 87.0 ± 49.0 ng/mL and 30.7 ± 17.3 ng/mL to 1198.5 ± 1017.2 ng/mL and 698.2 ± 574.6 ng/mL with CTA and to 774.3 ± 811.6 ng/mL and 509.0 ± 417.3 ng/mL with ATA®, respectively. The average expression of CD41 and CD42b decreased to 82.8 ± 9.7% and 80.1 ± 11.6% with CTA and 81.9 ± 14.3% and 80.2 ± 13.6% with ATA®, respectively. Observed dialyzers showed less platelet activation as commercial products, and differences between CTA and ATA® were not significant in terms of PF4, β-TG, CD41, and CD42b. Substantial activation of platelets can occur in the course of hemodialysis . The degree of activation of platelets depends on the materials composing the hollow fibers of the dialyzer . Therefore, improvements of dialysis membranes have concerned biocompatibility. Historically, cellulose-based materials were used for the manufacturing of hollow fiber membranes and still remain to date one of the most commonly used membranes . Although regenerated cellulose was the mainstream membrane material in the past, the cellulose triacetate (CTA) dialysis membrane is used currently. Though conventional CTA membrane has a homogeneous structure, recently, CTA membrane with asymmetric structure (ATA®) was developed. By a new spinning technology, irregularities or roughness in the inner surface of ATA® membrane became less than those of the CTA membrane . It is considered that the surface roughness of the membrane surface affects the platelets . However, biocompatibility in ATA® membrane has not yet been clearly demonstrated because the ATA® membrane was commercialized recently. In this study, a comparison was made between CTA and ATA® membranes in order to evaluate the effect of physical structure of the membrane on the biocompatibility. Two kinds of dialyzers were used for this study. We compared the biocompatibility of the following two dialyzers with different triacetate membrane: FB-190UHβ with conventional CTA, and FA-190F with ATA® (both from Nipro, Osaka, Japan). The details of dialyzers were specified in Table 1. The hemodialysis blood circuit produced by Kawasumi Laboratories Co., Ltd. (Tokyo, Japan) was used in this experiment. First, blood circuits and dialyzers with either CTA or ATA® membrane were connected and were rinsed with 1000 mL of saline solution, respectively. Subsequently, the dialysate side of the dialyzer was rinsed with 2500 mL of saline solution. Next, heparin of 40 units/mL was put in a syringe, and test blood was collected from healthy volunteers. The data of volunteers’ blood were specified in Table 2. Each circuit was filled approximately 100 mL of test blood obtained from one volunteer. Then, the blood drainage side and the blood return side of the circuit were connected using a female-female connector, and the circuits were made into closed. Consequently, the blood was circulated by a roller pump at the rate of 200 mL/min. The circuit was immersed in a thermostatic bath and maintained at 37 °C. We measured the platelet counts, CD41 and CD42b platelet surface markers, β-thromboglobulin (β-TG), and platelet factor 4 (PF4) at 30, 120, and 240 min after the initiation of blood circulation. After experiment, the dialyzers were then filled with 2.0% glutaraldehyde for immobilization of blood components adhering to the membrane surface. The inner surface of the fiber was exposed using a razor and observed by a field-emission scanning electron microscope (FE-SEM, SU-820 system, Hitachi, Tokyo, Japan) after each experiment. All data are shown as mean ± standard deviation. The platelet counts were analyzed by repeated analysis of variance (ANOVA). The CD41, CD42b, β-TG, and PF4 were analyzed by paired t test. The comparison was considered significant when p < 0.05. All data were analyzed using Statcel2 (the AddIn forms on Excel). The average platelet counts at 30, 120, and 240 min in CTA and ATA® were similar (Fig. 1). The average expression rates of CD41 and CD42b after the circulation were 82.8 ± 9.7% and 80.1 ± 11.6% with CTA and 81.9 ± 14.3% and 80.2 ± 13.6% with ATA®, respectively (Figs. 2 and 3). Levels of β-TG and PF4 after the circulation increased from 87.0 ± 49.0 ng/dL and 30.6 ± 17.3 ng/dL to 1198.5 ± 1017.2 ng/dL and 698.2 ± 574.6 ng/dL with CTA and to 774.3 ± 811.6 ng/dL and 509.0 ± 417.3 ng/dL with ATA®, respectively (Figs. 4 and 5). No adherence of platelets on both membranes was found in observation by FE-SEM (Fig. 6). The average hematocrit after the blood was filled in the circuit was 35.8 ± 8.2% with CTA and 36.5 ± 5.2% with ATA®. 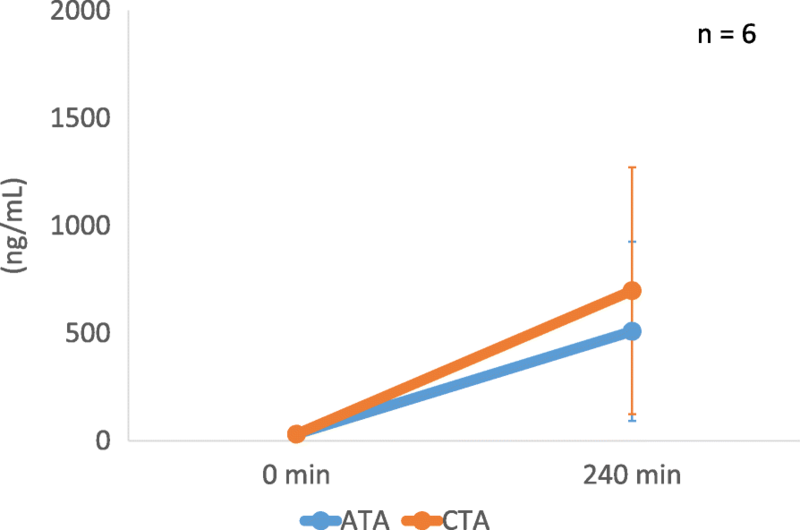 This study determined the blood compatibility in CTA and ATA® membrane. 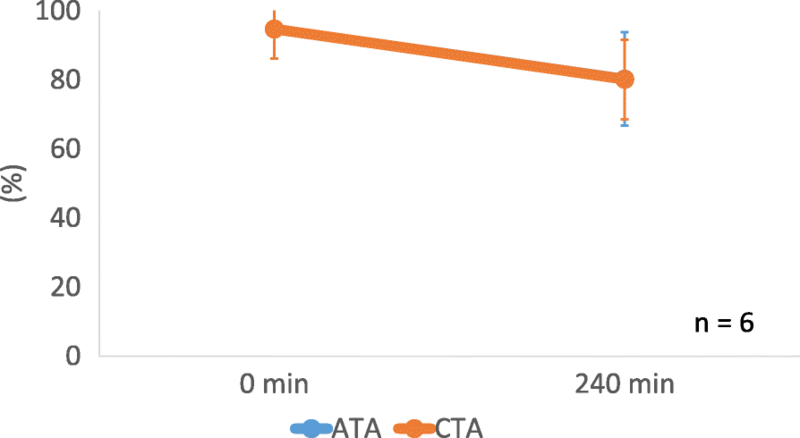 We demonstrated that the platelet counts and platelet surface markers (CD41, CD42b) decreased with time, while β-TG and PF4 increased with time; however, there found no difference between traditional CTA and ATA® membranes in terms of these markers. The irregularities or roughness in the inner surface of the ATA® has become less than those of CTA membrane. Because it is considered that the surface roughness of the membrane affects the platelet , we hypothesized that the ATA® membrane would show less platelet adhesion and activation. A lot of risk factors for mortality have been proposed in hemodialysis patients . Biocompatibility of hemodialysis membranes affects the survival, morbidity, and quality of life of uremic patients undergoing maintenance HD therapy . It is well-known that interactions between blood and the hemodialysis membrane include complement activation, direct activation of cellular components, and initiation of the coagulation cascade . Moreover, factors that promote platelet activation and adhesion in dialysis membrane include material, hydrophobicity, charge, number of hydroxyl (OH) groups, method of sterilization, inner diameter of hollow fiber, and roughness of membrane surface [2, 5, 8–12]. Among these factors, it is considered that the hydrophobicity and the roughness of the membrane surface are particularly involved in the activity of platelets. Itoh et al. reported that platelets preferentially adhered to hydrophobic surfaces rather than to hydrophilic surfaces . Moreover, they also reported that hydrophobic membranes possessed higher levels of activity for platelet adhesion and activation than hydrophilic membranes. Actually, there are several reports about improvement in platelet counts and activation when the hydrophobic membrane was changed to cellulose membrane [13–16]. In addition, the surface roughness of the ATA®, CTA, and polysulfone membranes are 4.5, 5.5, and 9.2 nm, respectively . The surface roughness in CTA and ATA® is approximately half of polysulfone membrane. Both CTA and ATA® are hydrophilic in nature; moreover, the membrane surface of CTA and ATA® were both smooth. Consequently, we found only a limited amount of adhesion and activity of platelets in both membranes. 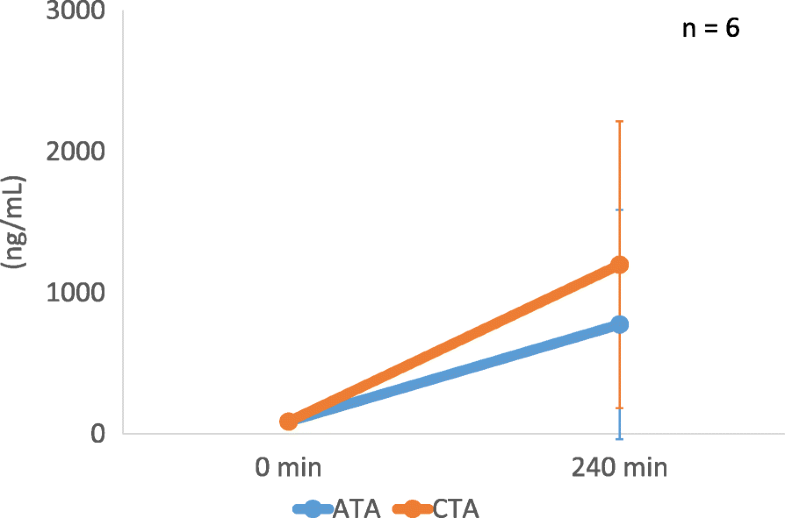 Although there was no significant difference in the levels of β-TG and PF4 in CTA and ATA® membrane, these numbers in ATA® tended to be smaller than those in CTA. These results suggested that the activation of the platelets may have been stronger in CTA than in ATA®. Above findings included several limitations. This study was performed using healthy volunteers’ blood. The reason was that dialysis patients need ultrafiltration or water elimination. If more water is eliminated, the blood within the hollow fiber will become more concentrated, and there is the possibility that the platelets will more easily adhere to the hollow fiber. In order not to be affected by it, samples of blood from volunteers were circulated through ATA® and CTA with no ultrafiltration and compared. Moreover, there are several differences between healthy volunteers and dialysis patients. The number of platelets in the patients on dialysis is small . In addition, the platelet count decreases as the hemodialysis period becomes longer . Moreover, the reactivity of the platelet usually increases in the patients on dialysis . Therefore, it may be better to use dialyzers with smoother surface membrane (ATA®) in the patient on dialysis. CTA and ATA® dialyzers have shown less platelet activation, and no statistically significant differences were found in terms of CD41, CD42b, β-TG, and PF4. Also, the membrane surfaces after the experiment were similar in terms of platelet adhesion according to the FE-SEM observation. Platelet activation may strongly occur depending on the membrane materials and surface roughness of the membrane. It may be better to use dialyzers with smoother surface membrane (ATA®) because the reactivity of the platelet increases in the patients on dialysis. The authors thank all the participants and contributors to the study. In particular, we would like to thank Dr. Kunio Ebine, Kodokan Bldg. Clinic, Tokyo, Japan. KT planned the study, searched the literature, assessed the studies, extracted the data, analyzed the data, and prepared the article. MY and MI assisted in the data collection. KA and AY helped to draft the manuscript. KT is responsible for the manuscript. All authors read and approved the final version of the manuscript. This study was conducted in accordance with the guidelines of the Declaration of Helsinki and approved by the ethics committees of Kodokan Bldg. Clinic (approval number 2017-2). We obtained written informed consent from all participants. We have also obtained the consent to publish from the participant. Olafiranye F, Kyaw W, Olafiranye O. Resolution of dialyzer membrane-associated thrombocytopenia with use of cellulose triacetate membrane: a case report. Case Rep Med. 2011; https://doi.org/10.1155/2011/134295.